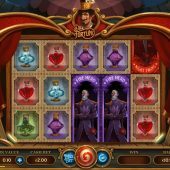 Dr Fortuno slot from Yggdrasil has one of those themes which use Victorian-era magic and mystery and as is typical of the subject the reels sit over a wooden stage with curtains by the side. You play to magician's music as with other slots of the genre such as their Baron Samedi, Foxium's The Great Albini and Play'n Go's Street Magic and the initial appearance is very good it must be said. Dr Fortuno has a huge variety of tricks up his sleeve, but will any of them be likely to add a little magic to our bankroll? 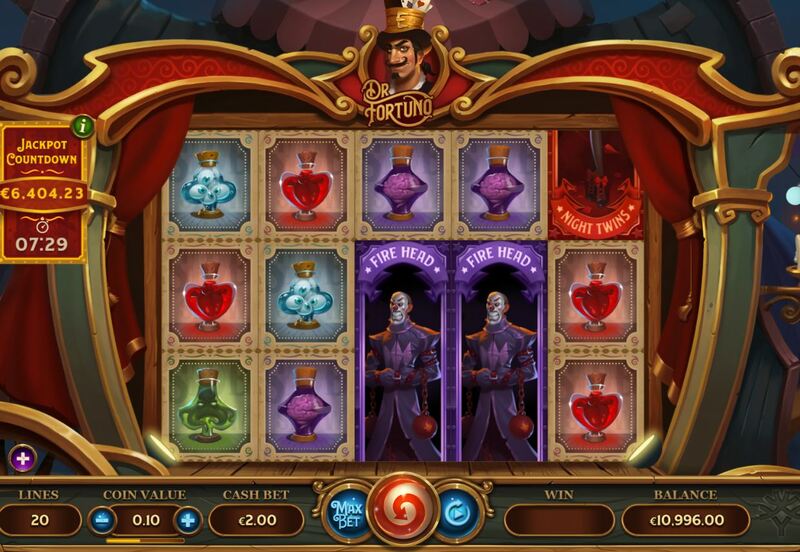 There are 20 fixed pay lines on Dr Fortuno slot and a variety of stacked and single symbols too. The 5-of-a-kind pays are 20x bet for the Night Twins, 12.5x for Fire Head and 10x for Water Witch. These are the three top icons and are red, purple and green respectively and all can appear fully-stacked on all reels. There are red and blue Potion Bottles paying 5x and green and purple ones paying 3x for a full line. You get Dr Fortuno's hat on all reels as the bonus scatter but as you might expect from a magic theme there are some funny goings-on before we get to the feature! Dr Fortuno can appear on any reels and is a Wild too. Like Netent's Steam Tower slot it only activates if fully in view and triggers a Wheel feature. You can win 1 to 5x bet, 2 extra spins of the wheel or a 2 to 5x multiplier for any coins collected. There is also a Jackpot segment which will award the progressive and a Jackpot Chance segment which will award a prize game in which you may win the progressive. Yggdrasil have capped the jackpot so in some cases it may begin counting down at your casino so the clock indicates it muct be won in that time period left. If you see three or more Hat scatters then 10 free games occur. No retriggers but you get one random enhancement from the Clown ball dispenser, or 2 or 3 if you are lucky enough to see a 4 or 5-scatter trigger. During the spins the Fortuno Wild will expand if it can create a win and therefore is more frequent and it still awards the Bonus Wheel each time. Your possible enhancements are 5 or 10 extra free spins, both-way pays and a 2x multiplier. You can win any 3 of these. There's another section of enhancements you can only get 2 of and those are low-paying symbols removed, more Wilds on the reels or one of the top 3 symbols is turned Wild for the duration. All enhancements are in play on every free spin if you manage to get more than one.